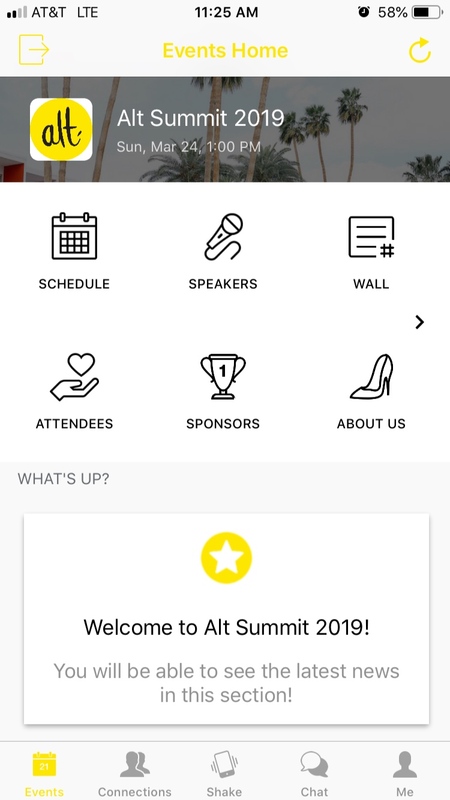 Go to the Android or iPhone app store and search for “Alt Summit” or visit this page. Find our happy yellow logo and download the app. (It's free!) You’ll know it’s the right one when you see a blue sky and palm trees. After you download the app, it will ask you to Sign Up. This will create your Attendee Profile, so you can see the content, plus chat and connect with all your fellow attendees. It’s up to you how much information you want to provide, but keep in mind, that this app is only for registered attendees and your information is totally safe. Once you’ve filled in your profile, it will ask you to choose an event. There’s just one option: Alt Summit 2019 - easy, peasy! Select join now. Because this app is for registered attendees only, you will need a passcode, which will be sent to your email. Can I see the app from my laptop? Yes. If you’d you like to check out the schedule, sponsors and speakers from your computer or laptop, go here. Note: you will not be able to connect with attendees or build your own profile in this view. How do I find the speaker and description for each item listed on the schedule? Click the title of the item and it will show you the full description, plus any speakers connected to that session. Click on the speakers' names to read their bios and find their site link. Can I choose classes and plan my schedule for the conference? Yes. On the schedule, you can see what’s happening by day or by subject. Start to build your own personal schedule by touching the + icon next to anything that you’d like to attend. There's a LOT of stuff on the schedule. Can I filter by topic? Want to see everything being taught on marketing, podcasting, and video? Toggle those tags, and classes that fit that description will appear. You’ll see these colored tags show up under the title and location of each session. You can also search by speaker. If there’s someone you’re dying to hear, click on their name in the speaker section. Under their bio, you’ll see any and all sessions they are teaching. I'm a speaker. Can I change my Speaker Profile? If you are a speaker, your professional profile will live in the speaker section. This can only be edited by the Alt team. If there are typos in your Speaker Profile, email us at hello@altitudesummit.com and we'll make those corrections. If you've already requested changes to your speaker bio on our website, those changes will also be made on the app. If you’d like to connect with other attendees and sponsors, or write on the wall, you’ll need to create your own Attendee Profile. When you “sign up” on the app, your attendee profile is created. You have total control over this profile and can add any information you’d like. You should definitely create an Attendee Profile. What are options I'm seeing in the menu bar at the bottom of the app? Along the bottom of the app you’ll see these options: Events, Connections, Shake, Messages, Me. Use Connections to make friends with other attendees. You won’t need Shake until the conference, it will allow you to quickly exchange contact info with other Alt-goers. You can use Messages to DM any attendee you’ve connected with. And if you need to edit or change your profile, you can do that in the Me section. I don't see anything about food or tours on the app. Over the next few weeks we’ll be adding maps, information about food and shuttles, more details about the parties, tour info, and updating any changes to the schedule, sponsors and speakers, so be sure and check in every so often. Use the "refresh" icon on the top right of the app (the circle arrow), to make sure the info you're seeing is up to date. And if you see a red circle, it means that session has been updated. My friend isn't coming to the conference. Can she connect with attendees on the app? The Attendee Profiles are for registered attendees only. But she is welcome to check out the schedule and speakers using web view.